Nave Newell is pleased to announce that the Lansdale Municipal Complex was awarded a 2017 Montgomery Award by the Montgomery County Planning Commission for excellence in planning and design. The Montgomery Awards Program is celebrating 50 years of excellence in 2017. This prestigious annual program recognizes the best in planning, design, and advocacy in Montgomery County. The program promotes awareness of outstanding design and innovative planning in our communities by awarding successful land developments, revitalization efforts, open space enhancements, environmental sustainability, and transportation improvements. The Lansdale Municipal Building project is an excellent representation of the revitalization of an older, more established community. The existing building was originally a federal post office, built in 1930’s and renovated in the 1980’s. It no longer served the needs of the borough. It was too small and separate from the police station. The new building plan included the preservation of the existing exterior facade and cupola and the construction of a new police/administrative annex with off-street parking. 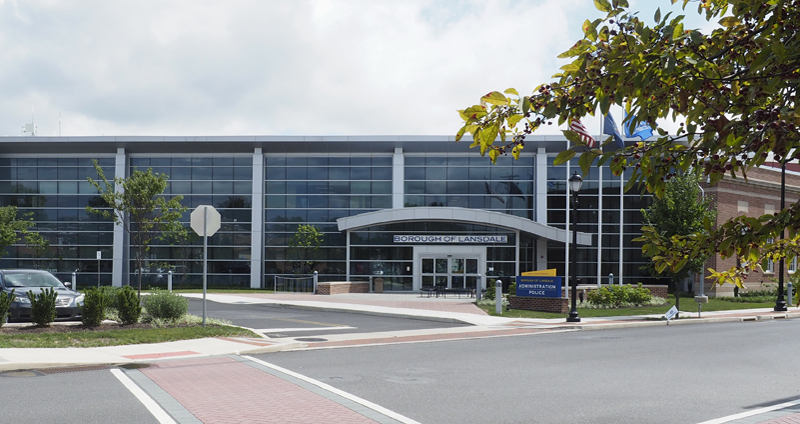 The result was a 35,000 sf, two-story complex which preserved portions of the existing building and combined the administration and the police department into one facility for greater efficiency. The new complex focuses on sustainability and efficiency was awarded LEED Silver Certification. To help maintain the historical context of the original borough hall, portions of the existing exterior facade were preserved. The historical limestone signage panels were also reused and reintegrated into the rear courtyard which faces the public corridor at Broad & Vine streets. To the extent practical, demolition materials were processed on-site to be used as subbase and project fill. Site sustainability features included a rain garden to promote stormwater infiltration and improve water quality with a landscape design featuring native plants. Revised parking and circulation areas combined with exterior sidewalks and plazas create an inviting entrance to the site. The front entry courtyard features a seating wall, flagpole, bike racks and a large outdoor plaza for community gatherings. The borough ordinance allowed for flexibility of parking spaces due to proximity and pedestrian access ways and public transportation. The project fronts on the Liberty Trail, is adjacent to the Lansdale SEPTA Regional Rail line as well as located along a SEPTA Bus Route and will ultimately be part of a broader public pedestrian corridor. Borough officials have embraced sustainability in both design and building operations – managing one versus two facilities and maximizing budget resources. They have maintained the historical location and key architectural aspects of the building – a marriage of both historical architecture and modern architectural vernaculars in a very successful way. It is a modern meeting hall for residents to come together. 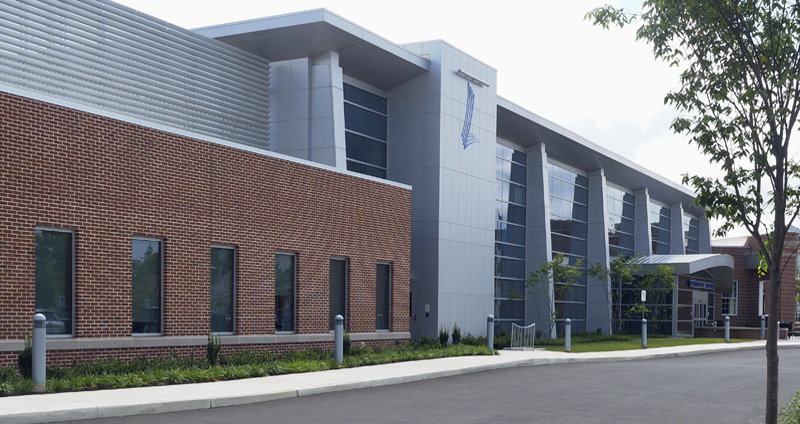 The planning and design of this redevelopment project has resulted in a beautifully renovated municipal complex and enhanced community image for the Borough of Lansdale. We look forward to celebrating this accomplishment along with Borough officials and project team members including Spiezle Architectural Group on Wednesday, November 15th.